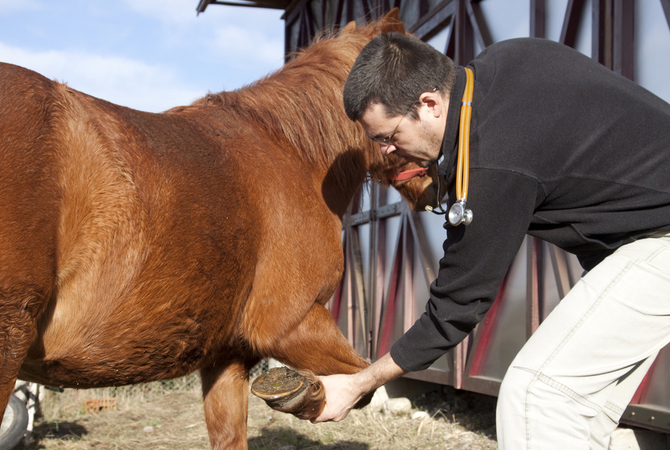 Veterinarian flexing horse's leg for lameness. What Causes a Horse to Go Lame? A common source of lameness may be caused by your farrier! A trim following a period of lacking hoof care often results in a mild lameness. If lameness persists for more than three for four days, their may be another cause. Due to the nature of lameness, a specific diagnosis of what is causing your horse's lameness is often difficult without an examination by a veterinarian who will be able to use diagnostic imaging, if needed. 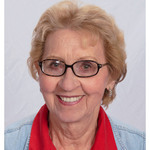 If you choose to do so, however, you may want to examine your horse and put the horse through a few paces to help you identify the location of the problem that is causing the horse to be lame. How Do I Identify the Location of the Problem? Careful observation is the key to identifying what is causing the lameness. By using your eyes and your hands as you examine your horse and then observing your horse in action, you may be able to locate the cause of the lameness. If not, your next step is to call your veterinarian. Begin with the feet, since many cases of lameness begin here. Pick the horse's feet and make sure no rocks are wedged into crevices. Look for dark spots that might indicate a bruised sole. Check for discharge or odor. 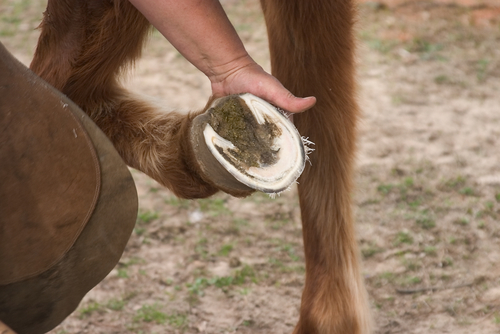 Look for cracks, and check to see if the hooves have been trimmed too short, if a nail is close to the sensitive structures of the hoof, or if the shoe doesn't fit properly. Move the heels, tap the hoof wall, and use hoof testers if you have them. Feel the hooves. Is one hoof warmer than the others? Do you find a pounding pulse? If so, these are indications of injury or possible abscesses. Check the lower legs for heat and swelling that might indicate inflammation. The horse may have an injured tendon or ligament. Note any abnormal stance such as favoring one leg, pointing the toe, or a dropped fetlock. Look for wounds or injuries to the lower legs. Check the joints carefully for heat and swelling. Horses can suffer from arthritis and other degenerative diseases. Has the stifle slipped and locked? A horse may have a bone chip floating in the joint. Flex and extend the joint to observe range of motion and to check for pain. Note any areas that are inflamed, as evidenced by heat and swelling. Check the neck and back for symmetry, posture, and contour. As you move your hands over the horse's neck and back, notice any indications of swelling, pain, heat, inflammation, or loss of muscle tone. Does your horse flinch when you approach with the saddle or move away from your touch when you attempt to brush the neck or back areas? Are there any changes in range of motion? Most lameness problems involve a structure in or below the knee or hock, so, as you move forward with your observations, pay close attention to the legs of your horse. Now, check the horse's gait on a level, even surface with several maneuvers including a walk and a trot, in a straight line and in a circle. The horse may either be led or lunged, but watch the horse going in both directions. As you observe from the side, rear, and front, try the horse on soft and hard surfaces, as well as up and down inclines. Note any abnormal head movement, including a bobbing of the head as steps are taken, hip hiking as the horse walks or trots, reduced arc of foot as the limb is flexed, a shortened stride, or abnormal foot placement such as landing toe first. Your objective is to determine which leg is affected or if more than one leg is affected. Also, does the problem originate in the leg, or does it originate in the horse's neck, back, or another area? Again, most cases of lameness in a horse require the attention of a veterinarian who has the background, equipment, and expertise to do a thorough diagnosis and prescribe the best possible treatment for your horse. Lameness is a most common condition, occurring in virtually all horses from time to time. Learn more about lameness in this equine veterinarian reviewed article, Diagnosing Lameness - The Veterinary Process.